Biologists at the University of Manchester want help in cracking their "miracle" discovery of three fish inside a sealed egg. The group found the duck egg in a small pond on a field trip to the French Alps and noticed something moving inside it. 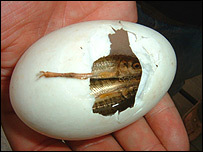 When they cracked open the shell, three live minnows were inside. They have enlisted the help of other experts, but despite their extensive combined knowledge, the biologists admit they are "baffled". Dr Matthew Cobb, a lecturer in animal behaviour at the university, said: "As 21st century scientists rather than 17th century antiquarians we think it's unlikely this represents a hitherto unknown mode of fish reproduction. "Perhaps the egg fell into the pond following some kind of predatory attack but we're baffled as to how the minnows got to be inside. "Certainly, we didn't see any crack in the egg." Dr Cobb and his colleague, Henry McGhie, head of natural sciences at the Manchester Museum, have written to the New Scientist magazine in the hope readers will help solve the mystery. Minnows are small freshwater fish, often used as bait by anglers. I read once of other such strange things. For example a manmade technological tool inside of geological structures where never a human had been.